This free, downloadable curriculum provides high school students with a deep understanding of critical food system issues, empowers them to make healthy and responsible food choices, and encourages them to become advocates for food system change. The food system spans the activities, people and resources involved in getting food from field to plate. Along the way, it intersects with aspects of public health, equity and the environment. Why Teach the Food System? The public has shown a growing concern for food system issues. Widespread problems such as chronic illness, infectious disease, social inequality, animal welfare harms, environmental degradation, and the concentration of economic power have ties to the food system. 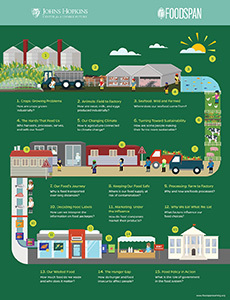 Recognizing these connections can empower young people to become not only informed consumers, but also food citizens who can engage in many facets of the food system, from growing their own food to advocating for policies.